Event: WLLD’s Wildsplash Venue: Coachman Park Location: Clearwater, FL Date: March 12th, 2005 Traditionally, traffic for Wild 98.7’s annual Wildplash at Coachman Park (1) is backed up miles away. 2005 is no exception. After a morning of bumper-to-bumper stop-and-go, the OZONE/CRUNK truck comes to a rest at a makeshift parking lot several blocks away from the park. Brooke Valentine (2) starts things off, and next up is Pitbull. People are still filtering into the park. Florida afternoons in early March are gorgeous. Clear blue sky, sun shining, but not too hot. Event organizers couldn’t have picked a better date (or a better caterer). Wildsplash performance lineups are typically strange, sandwiching acts like Capleton and The Roots between radio favorites like Pitbull and Mario. 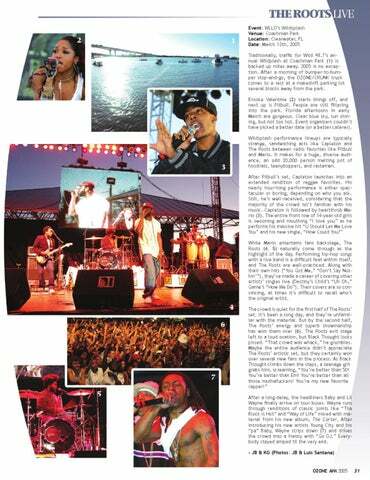 It makes for a huge, diverse audience, an odd 20,000 person melting pot of hoodrats, teenyboppers, and rastamen. While Mario entertains fans backstage, The Roots (4, 5) naturally come through as the highlight of the day. Performing hip-hop songs with a live band is a difficult feat within itself, and The Roots are well-practiced. Along with their own hits (“You Got Me,” “Don’t Say Nuthin’”), they’ve made a career of covering other artists’ singles live (Destiny’s Child’s “Uh Oh,” Game’s “How We Do”). Their covers are so convincing, at times it’s difficult to recall who’s the original artist. After a long delay, the headliners Baby and Lil Wayne finally arrive on tour buses. 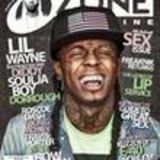 Wayne runs through renditions of classic joints like “Tha Block is Hot” and “Way of Life” mixed with material from his new album, The Carter. After introducing his new artists Young City and his “pa” Baby, Wayne strips down (7) and drives the crowd into a frenzy with “Go DJ.” Everybody stayed amped til the very end.